The best way to curb sugar cravings is to increase the number of naturally sweet, wholesome foods in your diet. I just returned to New York City from a weekend in the Catskills, where I whiled away a blissful afternoon enjoying a bowl of sweet, juicy cherries. Now that I’m back in NYC, I can’t stop thinking about those cherries and all the sweetness summer can bring. Cherries aren’t just a great way to get your sweet on. They pack a slew of anti-inflammatory, anti-aging, and anti-cancer compounds, including perillyl alcohol, which inhibits tumor growth, and ellagic acid, which kills cancer cells without harming healthy normal cells. Cherry juice contains anthocyanins, which help to relieve inflammation throughout the body. But keep in mind that the Environmental Working Group listed cherries among the 12 foods most contaminated with pesticides, so it’s important to buy organic. 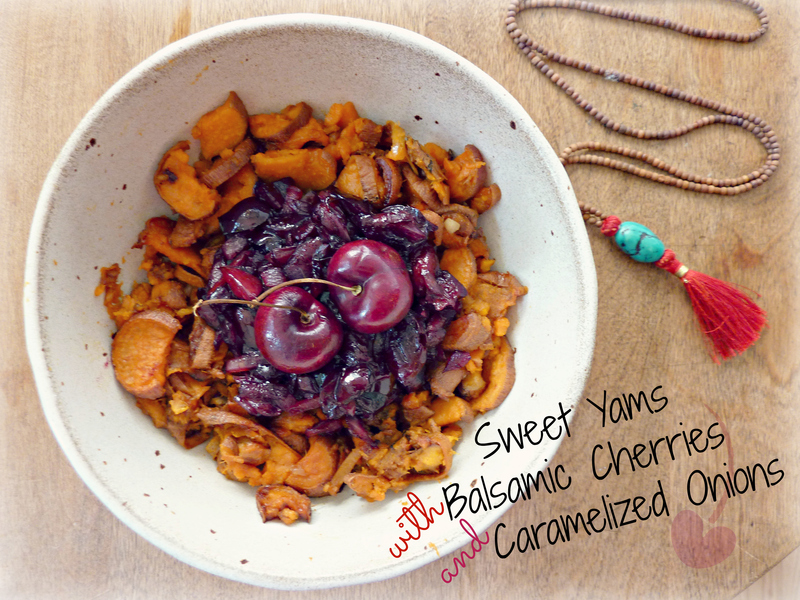 For this recipe, I paired cherries with the natural sweetness of caramelized onions and the candy-like confection of baked yams. It’s a combo that’s guaranteed to nip unnecessary sugar cravings in the bud. It makes an excellent side dish or a light meal on its own. And it’s so creamy and yummy that I bet it’d make a great breakfast as well. Wash yams and chop them into uniformly small chunks. 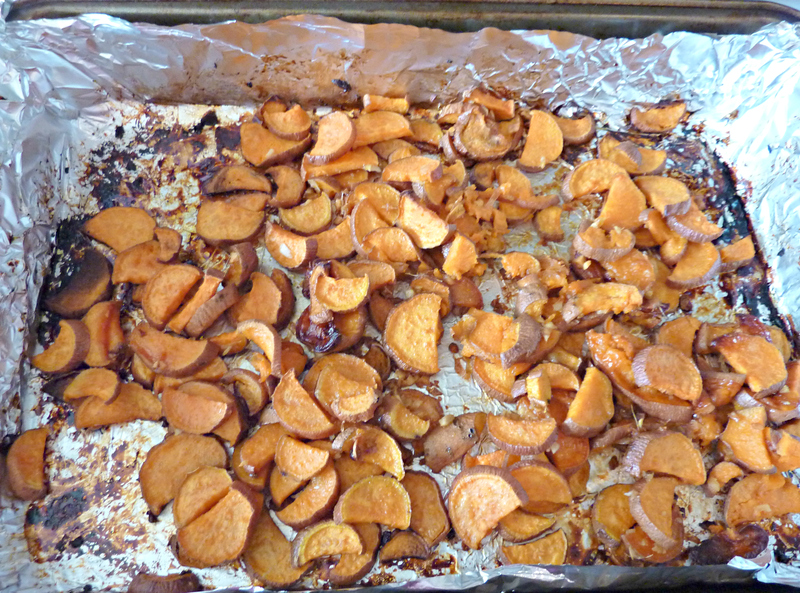 Add yams, minced ginger, and minced garlic to a baking pan that has been lined with tin foil (save yourself the mess – they get sticky). Coat yams with coconut oil and maple syrup. 1 to 2 tbsp each should do it. Equal amounts. Use as much or as little as makes sense to you. Bake yams at 400 degrees Fahrenheit for approximately 45 minutes. Meanwhile, heat a dollop of coconut oil in a large sauté pan. Add chopped onions to the pan and sauté on VERY LOW HEAT for 20-30 minutes until they begin to caramelize. When onions have begun to brown, add chopped cherries and balsamic vinegar. 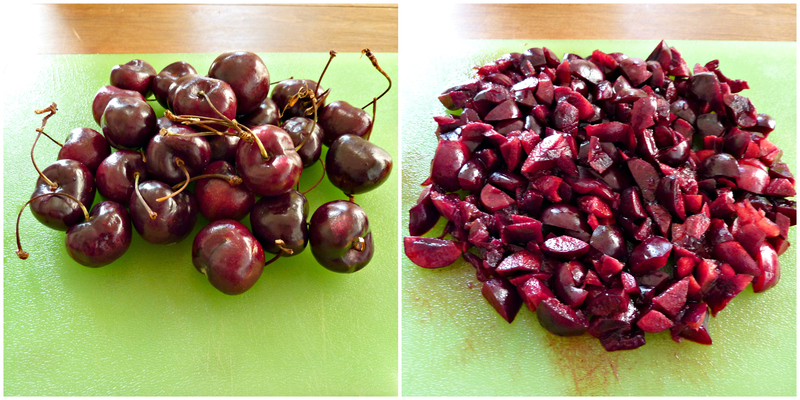 Continue to sauté for an additional 15-20 minutes, until the cherries have softened and the mixture is a bit syrupy. 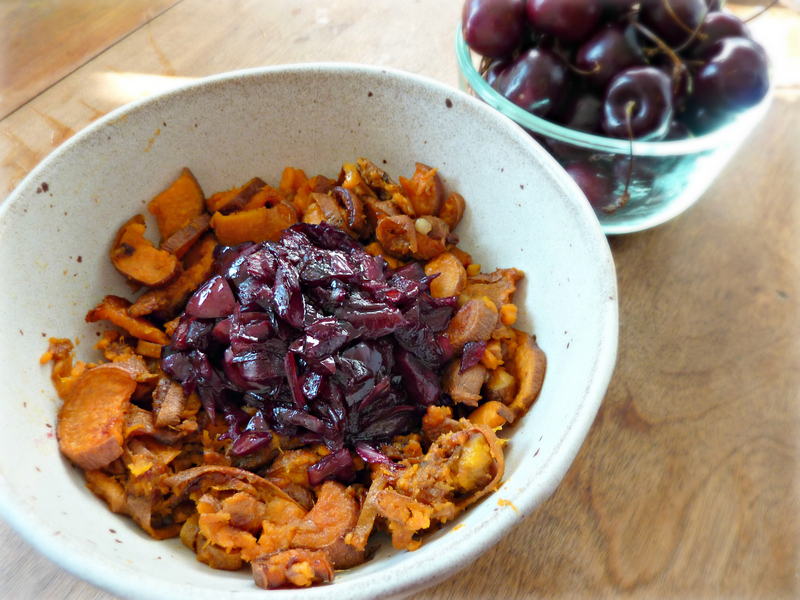 Serve the baked yams with a mountain of the cherry- onion mixture right on top. I like mine with a light sprinkling of sea salt. The subtle flavors of the roasted garlic and ginger with the intensely sweet and tart balsamic cherries make this dish absolutely irresistible – and worth turning the oven on in the summer.